Panic Attack – The Devil’s Favorite Game is the latest game from DeRail Games, makers of Jump ‘n’ Bounce. 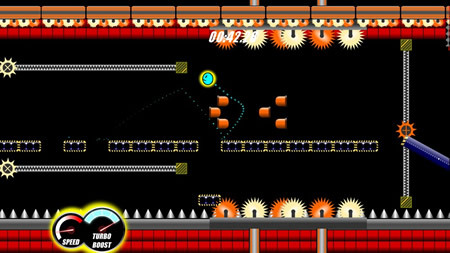 The game is a semi sequel to Jump ‘n’ Bounce and uses a same style of look & controls. However it’s a completely different game. The game in Panic Attack is to race from the beginning of the level to the end of the level as fast as you can. On the way are all sorts of enemies put a stop to your progress, but there’s also an added “Speed Boost” to help you in the race against time. 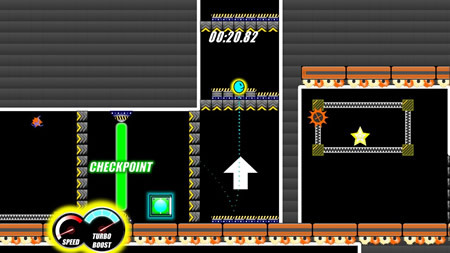 There’s also a checkpoint halfway through the level to help you through the level, as trust me, you’ll need it. You see, unlike Jump ‘n’ Bounce you have infinite lives, but the challenge is to complete levels in the fastest time you can. Depending on the speed in which you complete level earns you a bronze, silver or gold medal, which unlocks later levels. Don’t complete it fast enough & you haven’t to do it again. And again. And again. You see, this game is very frustrating and you will be swearing at the TV multiple times, and I wouldn’t say you need skill to advance, rather you need patience & repetition to complete the game in a fast enough time. Seconds need to be shaved off from times, and you need to repeat levels over & over to do it. What makes it worse is that the sound effect that plays when you die is rather annoying. With that said, this game does have the same level of quality that the previous game. It’s not bad luck that you fail on Panic Attack, it’s because you aren’t playing the game well enough. The game is well coded & is solid, just very very tough. Panic Attack has a great graphical style, and – annoying sound effect aside – the soundtrack is brilliant. If you’re after a classically tough game, or want to fill your swear jar as quickly as possible, this game is for you. It’s a tricky distraction over Christmas, for 80 Microsoft Points, available now on the Xbox Live Indie Games.